With a title like "SlasherDerby," you'd probably expect a game involving a combination of bladed weapons and rundown cars. But instead of being a strange Mad Max ripoff, SlasherDerby, by Centerus, is a rather straightforward and unexciting boxing title. 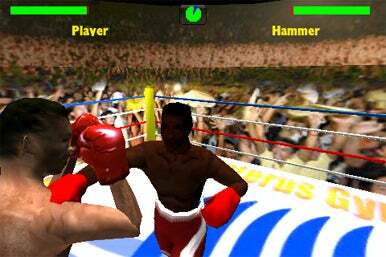 No, the game does not feature the licensed names of real boxers. Thanks to simplistic controls, SlasherDerby is an intuitive boxing game where you essentially tap your way to victory. The graphics are equally primitive, but at $2 that's not entirely surprising. When you launch the app, the tutorial isn’t immediately noticeable. But the home screen only has three buttons, so a little deductive reasoning will lead you to the “Useful Stuff” section. There, a 9-step training module will teach you all the moves you need. Boiled down, the screen is divided into six control squares, each with a different move. The top corners are hooks, the bottom ones are jabs, and the middle let you advance toward and retreat from your opponent. Tilting the device allows your boxer to “dance” around the opposition. The tutorial will tell you that each opponent has a unique “rhythm” and you have to sync up with it to beat him, but that might be intellectualizing it too much. I found that getting in the guy’s face and tapping until he falls down is as good a strategy as any. Gameplay is actually fairly easy, though there is a whole host of achievements to make it more interesting. A major problem, though, is that as far as I can tell there’s no way to return to the main menu once a match has started – you can tap the clock to pause, but that’s it. There are five unlockable opponents to choose from, as well as a few configuration features to tailor your matches— like limits for rounds and number of rounds to a match. Scores are recorded on a somewhat buried leaderboard section – you need to click on "Useful Stuff" then "Options" then "More Info" – powered by social networking platform Agon. There you’ll find scores according to class (Flyweight, Bantamweight, etc), awards (like “Survived First Knock Down”), and a friends section for sending invitations to other potential players. If you’re into boxing games, you could do worse than the simple and effective SlasherDerby. Otherwise, there’s nothing here so extraordinary that it can bridge the interest gap. Bottom line: SlasherDerby gets in a few good punches, but never lands a knock out.